Epilepsy with continuous spike-waves during slow-wave sleep (CSWS) is often characterized by a severe cognitive and behavioral impairment. Symptomatic cases also include patients with an early-onset hydrocephalus, but in literature detailed neuropsychological data on these subjects are not available. We describe the results of serial cognitive assessments in a girl with shunted early-onset hydrocephalus, followed by partial epilepsy complicated with CSWS at 4 years 10 months, in which a dramatic cognitive and behavioral deterioration occurred few months after CSWS onset. Adrenocorticotropic hormone treatment improved both clinical and electroencephalogram picture, but an impairment of visual perception, visual-motor coordination and executive functions persisted after CSWS disappearance. We hypothesize, in this case, an involvement of right occipital-parietal lobe and prefrontal lobe. Epilepsy with continuous spike-waves during slow-wave sleep (CSWS) is an age-related condition characterized by heterogeneous seizure types, neuropsychological and behavioral impairment and a typical electroencephalogram (EEG) pattern with diffuse slow spike-waves occupying at least 85% of slow-wave sleep. Approximately one-third of CSWS cases are symptomatic;  among them, patients with an early-onset hydrocephalus are described, ,,,, but thus far, detailed neuropsychological data concerning specifically these cases are not available. We describe, focusing on the cognitive and behavioral profile, the case of a girl with an early-onset hydrocephalus and CSWS in order to discuss possible etiopathogenetic hypotheses. The patient's family history was positive for febrile convulsion, epilepsy and speech delay. The girl was born at full term of an uncomplicated pregnancy and delivery, with normal psychomotor development. At 3 months, tonic downward eye deviations, vomiting and head enlargement occurred and the anterior fontanel was tense. Brain magnetic resonance (MR) showed a biventricular obstructive hydrocephalus, due to a third ventricle choroid plexus papilloma, ascertained by histological examination after complete surgical removal. At that time, no post-surgical complications have been reported, but brain MR showed persistent hydrocephalus. One month after tumor removal, a ventriculo-peritoneal shunt was placed on the right. Full clinical recovery followed surgery. EEG showed sporadic centro-temporal spikes, mainly on the right. At 3 years 6 months, during sleep, the first versive seizure, probably involving the occipital lobe, occurred. EEG showed bilaterally posterior paroxysmal abnormalities and computed tomography scan excluded a hydrocephalus relapse. A therapy with valproate was started but seizures persisted, approximately recurring twice a year. Since she was 4 years 10 months, diurnal sleep-deprived EEG recordings showed CSWS, with a spike-wave index of over 85% during non- rapid eye movement sleep, calculated according to Holmes and Lenck-Santini definition. We emphasize that the spike-wave index obtained from a diurnal sleep-deprived EEG recording is generally comparable to that calculated from a whole night EEG recording. Three months later, cognitive and behavioral deterioration began with episodes of spatial disorientation; later, restlessness, hyperactivity, inattention; regression of speech eventually limited to few words; mood lability; inversion of wake-sleep rhythm; enuresis, encopresis and loss of contact were reported. A few months later, an autistic-like condition was evident; furthermore, she had visual misperceptions. Brief, frequent seizures occurred with left gaze deviation, eyelid myoclonia, altered consciousness and vision of a blue light. Seizures and CSWS were drug-resistant. At our first observation (5 years 10 months), she was on valproate and ethosuximide and the neurological examination revealed the above described cognitive and behavioral impairment. EEG showed multifocal (predominantly posterior), diffuse and generalized spike-waves, which were continuous during slow-wave sleep, with a spike-wave index = 94% [Figure 1]. A comprehensive neuropsychological assessment was impossible due to her lack of cooperation. She showed abulia, perseverations, lack of empathy and poor speech with mechanic prosody. Clonazepam and acetazolamide addition were ineffective. At 5 years 11 months, due to adrenocorticotropic hormone (ACTH) treatment, CSWS progressively disappeared. Since she was 6 years 2 months, EEG showed infrequent focal (predominantly posterior), diffuse paroxysmal abnormalities; thence, seizures stopped and a prompt behavioral and cognitive recovery began. 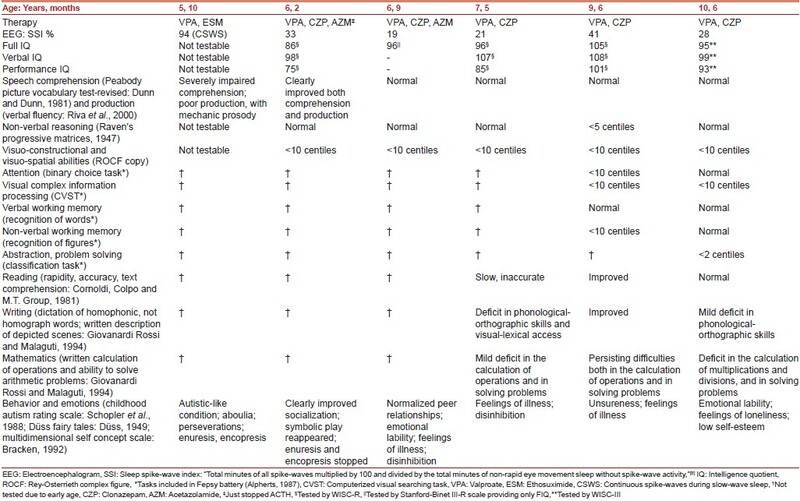 [Table 1] describes the results of neuropsychological assessments during follow-up in relation to EEG findings. At 9 years 6 months, a transitory EEG worsening was not followed by a clinical deterioration. At 10 years 6 months, our last observation (therapy: valproate, clonazepam), sleep EEG showed right parietal-occipital spikes, spike-waves [Figure 2] and less frequent left central spikes, sometimes diffuse. Compared with the previous assessment, WISC-III displayed a slight decrease of intelligence quotient [Table 1], already reported when using this scale in place of WISC-R.  WISC-III profile showed a significant impairment (P < 0.01) in the verbal subtest "arithmetic" (involving attention and numerical reasoning) and in the supplementary performance subtest "mazes" (visual analysis, visual-motor coordination, attention, planning); further, there was an almost significant (P ≈ 0.05) decrease in the supplementary verbal subtest "digit span," particularly backwards (short-term auditory memory, attention). Deficits of visuo-constructional and visuo-perceptual abilities, abstraction and problem solving, learning disability prevailing in mathematics and psychological findings (emotional lability, feelings of loneliness, low self-esteem particularly in the physical domain) were also evident. Available data confirm the pathogenetic role of CSWS in cognitive and behavioral deterioration also in patients with early-onset hydrocephalus. In the series reported by Veggiotti et al., all four testable patients who had an intellectual deterioration during CSWS recovered after EEG improvement. Furthermore, in the series of Caraballo et al., during CSWS all nine cases presented a transitory behavior worsening and all five patients tested before CSWS had a cognitive deterioration recovered after CSWS disappearance. However, a detailed, serial analysis of the neuropsychological pattern in patients with early-onset hydrocephalus and CSWS is still lacking, particularly with regard to the follow-up. 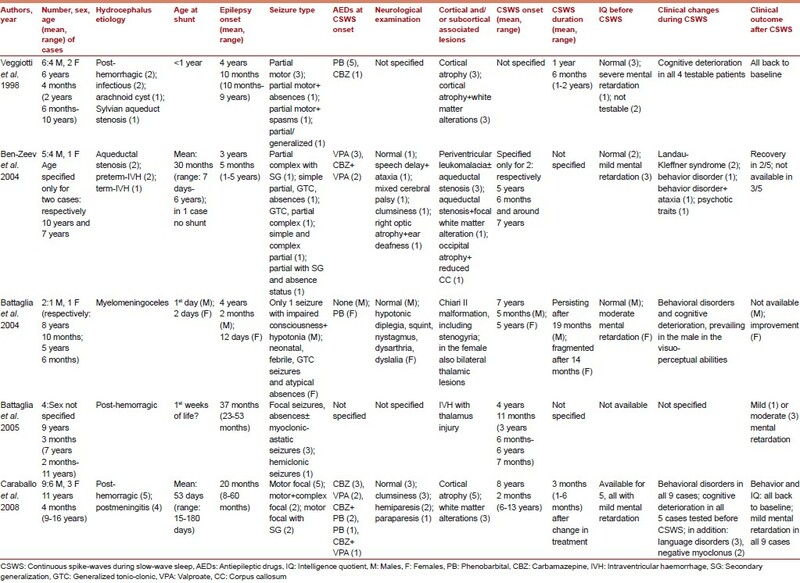 This may be due to the fact that most of the reported cases have an intellectual impairment, even before CSWS onset [Table 2], hampering a thorough neuropsychological assessment. For this reason, we reported our case to better define some cognitive peculiarities of this condition. Neuropsychological impairment in hydrocephalus " per se" entails deficits in several domains, particularly visuo-perceptual and visuo-motor functions,  but the pattern of our patient was clearly more complex: in fact, the preponderant signs were behavioral, with an autistic-like condition and neuropsychiatric disorders were closely related to EEG evolution. It has been hypothesized that the shunt is involved in the pathogenesis of EEG discharges,  and perhaps it is no coincidence that in our case the derivation for the hydrocephalus has been placed just on the right side, where EEG paroxysmal abnormalities prevailed. Obviously, EEG paroxysmal abnormalities and neuropsychological impairment in early-onset hydrocephalus could be also related to possible associated cortical/subcortical lesions,  but in our case, after surgery, MR did not document any cerebral lesions. Due to ACTH, clinical-EEG picture drastically improved, but an impairment of visual perception, visual-motor coordination and executive functions persisted, suggesting a dysfunction of these abilities depending not only from CSWS. Considering neuropsychological data, an involvement of right occipital-parietal lobe and prefrontal lobe could be hypothesized. This pattern is only partly tied to the location of predominant EEG foci in the posterior regions, but, as De Tiège et al. suggested, basing on functional cerebral imaging studies, cognitive impairment in children with CSWS may also be related to neurophysiological changes in far brain areas connected with the site of EEG foci. We suggest that serial neuropsychological assessments should be performed, during the follow-up, in patients with early-onset hydrocephalus and CSWS to test and verify the cognitive and behavioral pattern that we found in our case. 1. Tassinari CA, Rubboli G, Volpi L, Meletti S, d'Orsi G, Franca M, et al. Encephalopathy with electrical status epilepticus during slow sleep or ESES syndrome including the acquired aphasia. Clin Neurophysiol 2000;111 Suppl 2:S94-102. 2. Hughes JR. A review of the relationships between Landau-Kleffner syndrome, electrical status epilepticus during sleep, and continuous spike-waves during sleep. Epilepsy Behav 2011;20:247-53. 3. Veggiotti P, Beccaria F, Papalia G, Termine C, Piazza F, Lanzi G. Continuous spikes and waves during sleep in children with shunted hydrocephalus. Childs Nerv Syst 1998;14:188-94. 4. Ben-Zeev B, Kivity S, Pshitizki Y, Watemberg N, Brand N, Kramer U. Congenital hydrocephalus and continuous spike wave in slow-wave sleep: A common association? J Child Neurol 2004;19:129-34. 5. Battaglia D, Acquafondata C, Lettori D, Tartaglione T, Donvito V, Staccioli S, et al. 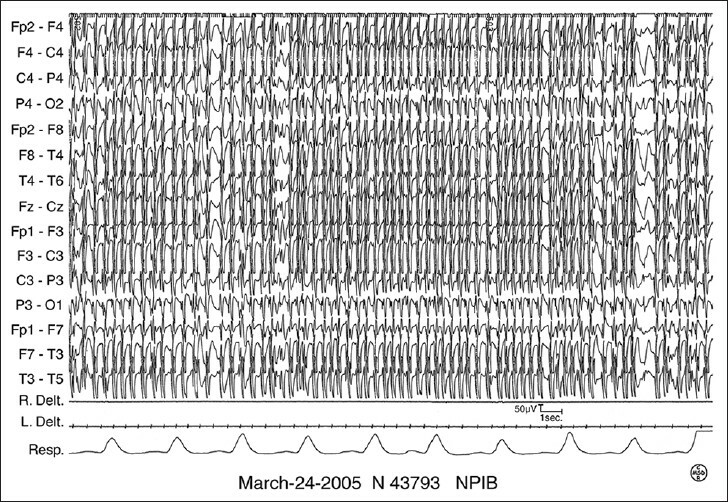 Observation of continuous spike-waves during slow sleep in children with myelomeningocele. Childs Nerv Syst 2004;20:462-7. 6. Battaglia D, Pasca MG, Cesarini L, Tartaglione T, Acquafondata C, Randò T, et al. Epilepsy in shunted posthemorrhagic infantile hydrocephalus owing to pre- or perinatal intra- or periventricular hemorrhage. J Child Neurol 2005;20:219-25. 7. Caraballo RH, Bongiorni L, Cersósimo R, Semprino M, Espeche A, Fejerman N. Epileptic encephalopathy with continuous spikes and waves during sleep in children with shunted hydrocephalus: A study of nine cases. Epilepsia 2008;49:1520-7. 8. Holmes GL, Lenck-Santini PP. Role of interictal epileptiform abnormalities in cognitive impairment. Epilepsy Behav 2006;8:504-15. 9. Larsson PG, Evsiukova T, Brockmeier F, Ramm-Pettersen A, Eeg-Olofsson O. 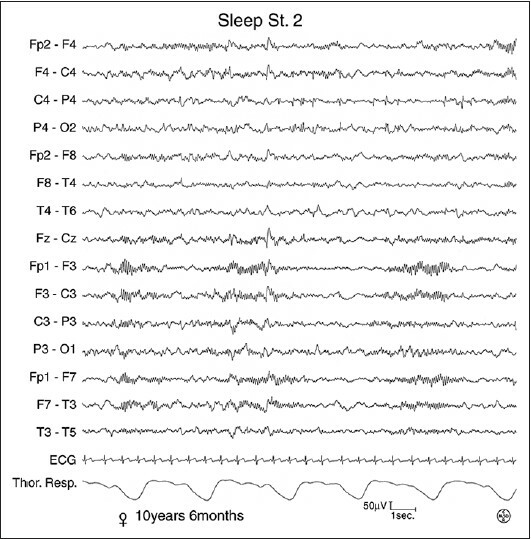 Do sleep-deprived EEG recordings reflect spike index as found in full-night EEG recordings? Epilepsy Behav 2010;19:348-51. 10. Sapp GL, Abbott G, Hinckley R, Rowell A. Examination of the validity of the WISC-III with urban exceptional students. Psychol Rep 1997;81:1163-8. 11. Rossi PG, Parmeggiani A, Posar A, Scaduto MC, Chiodo S, Vatti G. Landau-Kleffner syndrome (LKS): Long-term follow-up and links with electrical status epilepticus during sleep (ESES). Brain Dev 1999;21:90-8. 12. Roulet Perez E, Davidoff V, Despland PA, Deonna T. Mental and behavioural deterioration of children with epilepsy and CSWS: Acquired epileptic frontal syndrome. Dev Med Child Neurol 1993;35:661-74. 13. Erickson K, Baron IS, Fantie BD. Neuropsychological functioning in early hydrocephalus: Review from a developmental perspective. Child Neuropsychol 2001;7:199-229. 14. De Tiège X, Goldman S, Van Bogaert P. Insights into the pathophysiology of psychomotor regression in CSWS syndromes from FDG-PET and EEG-fMRI. Epilepsia 2009;50 Suppl 7:47-50.